According to the acting director of the Office of Management and Budget, Russ Vought, the Trump administration will in a few weeks submit a budget featuring a 5% across-the-board cut in non-defense discretionary spending for FY 2020 (defense spending will be excepted through the usual gimmick of using Overseas Contingency Operations funds). The Houston Chronicle connects this directly to a 5% cut in NASA's budget request, though I don't see a specific reference to NASA in Vought's article. 1) Executive branch gets inputs from various agencies regarding budgetary needs for the coming FY. 2) OMB then considers those inputs to varying degrees and crafts the President's Budget Request and submits it to Congress. 3) Congress tosses the PBR in the bin and comes up with their own plan, which they then fail to pass. 4) Hilarity A government shutdown ensues. 5) A continuing resolution is passed, funding everything at generally the previous levels. 2 March (i.e., today): The government hits the debt ceiling. Though the Treasury can keep paying the bills for several months by means of various gimmicks, there is probably a melodrama brewing over raising the debt ceiling. 11 March: Expected release of the president's budget outline. Vought has telegraphed that this will call for 5% cuts in non-defense discretionary spending. My guess is that the president's party will go along with this, setting up a big budget fight and likely cuts of some sort, though maybe not the full 5%. Democrat house and dems in the senate are not going to vote for a 5% cut on anything. Neither are most Republicans. Expect another shutdown. White house budget request is honestly a dead document. Won't pass won't even come close. Doubt there will be any cuts on anything. I think we should all remember that the last Congress actually passed all of the needed funding legislation pretty much on time, and quite a bit of it well before the end of the fiscal year. They were even celebrating how bipartisan the funding legislation was. What wasn't passed on time were the departments that ended up being shutdown when Trump would not sign the legislation Congress passed. The Presidents budget is a suggestion to Congress, but it does actually provide a roadmap for some of the funding priorities that Congress considers. As to NASA, Congress has been giving NASA far more funding than what the Trump Administration has been asking for, and funding programs that the Trump Administration did not want funded, so Congress will do what THEY want, not what anyone else wants (i.e. the President). WSJ from last Saturday announces a 2 % (not 5) reduction of overall NASA budget and an increase of more than $500 million for moon exploration and related programs. To pay for its stepped-up lunar initiative, NASA seeks to trim money from deep-space exploration projects including some ultimately targeting astronaut trips to Mars, according to the people briefed on the numbers. Projects expected to be affected include the heavy-lift SLS rocket and Orion capsule, one of these people said. These and other deep-space technology efforts would get less than previously projected, this person said. Congress may balk at some of the moon-centric concepts, partly because there has been strong bipartisan support to pump up spending on SLS, officially called the Space Launch System, which was supposed to fly next year but now may not blast off on its first demonstration mission until 2022, according to another person briefed on the numbers. • The National Aeronautics and Space Administration (NASA) is responsible for leading an innovative and sustainable program of exploration with commercial and international partners to enable human expansion across the solar system and bring new knowledge and opportunities back to Earth. 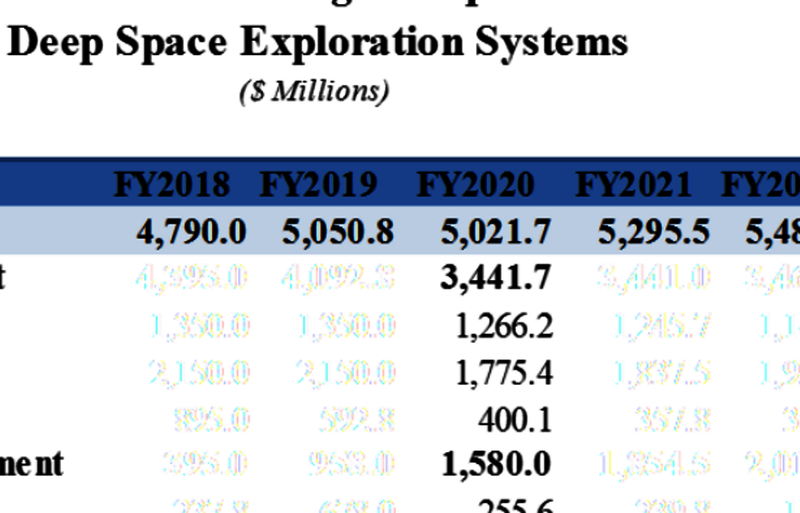 • The Budget takes steps to achieve lunar exploration goals sooner, improve sustainability of NASA’s exploration campaign, and increase the use of commercial partnerships and other procurement models to enhance the efficiency and effectiveness of NASA programs. • The Budget includes $363 million to support commercial development of a large lunar lander that can initially carry cargo and later astronauts to the surface of the Moon. • The Budget focuses funding for the Space Launch System (SLS) rocket, a heavy-lift expendable launch vehicle, to ensure the rocket is operational in the early 2020s when it will be needed to carry astronauts to the vicinity of the Moon. • The Budget requests $21 billion for NASA, a $283 million or 1.4-percent increase from the 2019 estimate. Supports an Ambitious Program of Solar System Exploration. The Budget provides $2.6 billion for Planetary Science, including approxi-mately $600 million for a mission to Jupiter’s moon Europa that would launch in 2023. By launching that mission on a commercial launch vehicle, NASA would save over $700 million, allowing multiple new activities to be funded across the Agency. The Budget would also initiate a mission to return samples from Mars, a top priority of the science community that also supports future human explora-tion. The Budget fully funds the James Webb Space Telescope, which is planned to be NASA’s premier observatory of the next decade. I've been saying for awhile that the Exploration Upper Stage (which is the key upgrade to SLS for Block 1B) has been put on ice. This raises a number of questions about how NASA will build the Gateway, which was intended for that rocket. What will happen is they will open up non-crew Gateway launches to private rockets. "Lunar Gateway elements would be launched on competitively procured vehicles, complementing crew transport flights on the SLS and Orion." Curious to see what the Congress makes of this. Will they reinstate WFIRST like last year for instance ? Wow. While a 1.4% increase for NASA is actually a cut after inflation, against the backdrop of general 5% cut in non-military discretionary spending, it's really something. And s Scaling Orion/SLS back about as much as possible without committing the utter political impossibility of canceling it, is surprising too. I see Bridenstine's fingerprints on this: he gets my vote for best NASA administrator in a long time. And, though I do not like Orion/SLS, I must grudgingly admit to more respect for the Trump administration's approach to NASA than I have given it in the past. At the top of this thread, my expectation was that the 5% across-the-board cut would apply to NASA to, and I expected support for that in Congress (because  congressional Republicans have been backing Trump to the hilt recently, and  an emerging theme of Trump's 2020 run seems to be that Democrats are big-government socialists). So, while I was wrong about a 5% cut for NASA, at least my prediction of support for it in Congress can no longer be proven wrong. Instead, I now expect even more widespread support for the actual proposal. EDIT: Crossed out much of the post, because the administration's characterization of it's budget as a 1.4% increase, while possibly not technically false, is at best very misleading. The budget summary and departmental fact sheets are attached as PDFs below. I've also attached the summary chart. In the fact sheets, the future estimates for specific exploration line-items have been excised. But poorly, allowing them to be forensically recovered. I've done so. This president's budget proposal for NASA is, like all preceding budget proposals, Dead On Arrival. Expect most, if not all, proposed cuts to be ignored by Congress. The President's Budget is the starting point. So it does have an impact. But you are right about the cuts, the Democrats control the House, so it won't pass the House. It won't pass in the Senate either since you need 60 votes for appropriation bills. Spending cuts rarely get passed regardless of which party controls Congress or the Presidency. Lot of things to like with this budget. SLS/Orion handle crew launch while commercial rockets handle the Gateway elements. Because of the once a year flight rate a cargo launch (w/o EUS) would automatically preclude a crew launch in a given year. This option allows much more flexibility in mission design and quite possibly a faster (and cheaper) buildup of the Gateway and return to the lunar surface. There are still some kinks to work out given that some modules were intended to be launched as co-manifested payloads. I am bummed about EUS being put on ice but I would rather see progress be made and flights happening than wait for an additional development. Agreed. I was cautiously optimistic when it was announced that he would be NASA admin and so far he has been doing a great job. Would love to be able to talk shop with him. In terms of exploration, I think this is a budget request that is trying to wean NASA off SLS, to have more funds for the administration's lunar and beyond ambitions etc. I think reveals what Bridenstine really thinks about SLS! Of course congress may well have different ideas, although the plan doesn't really change the SLS flight rate (in the next 3-4 years) so may be there's still enough work and thus money in the right districts? I guess we're about to find out how much Bridenstine's political background will enable him to navigate between what the administration wants to achieve and what congress is prepared to fund. Considering that the FY2019 final budget specifically called for funding of EUS and a second MLP, my expectation is to see those items put back in, along with a full education budget, which was cut to zero in this budget. A question, why are they trying to eliminate the education budget? This is not the first time I think. What is the rationale here? Anyone who keeps trying to kill a project like WFIRST would hardly qualify under my idea of good.